Mango Salsa: Makes about 1 cup, could be some left over. 1. Warm the tortillas in a tortilla warmer if possible at 175-200*F.
2. Pour about 1 ½ inches of peanut oil into a 3 ½ to 5 ½ quart Dutch oven. Insert a candy thermometer into the oil and heat to 375*F.
3. Sift 1 ½ cups flour into a large mixing bowl, add a pinch of salt and a pinch of red pepper flakes, then slowly pour in most of the beer until the batter is sticky. 4. Pat dry the fish with paper towels then coat with the batter. 5. Dredge the battered fish in the remaining flour and place several pieces in the hot oil. 6. Cook this batch, turning frequently until golden brown about 4 to 5 minutes. 7. Place this batch on a paper towel lined plate in a warming oven set to 175 to 200*F and repeat until all the fish is cooked. 7. Shred the cabbage while the fish is frying. 1. Mix ingredients in a ceramic, glass or stainless steel bowl. Cover, refrigerate and let age for at least 30 minutes before serving. 2. Let warm to room temperature before serving. We love Fish Tacos. We have cooked the fish several different ways and have used different kinds of fish. This time we used wild Icelandic Cod and chose to fry it in Beer Batter. 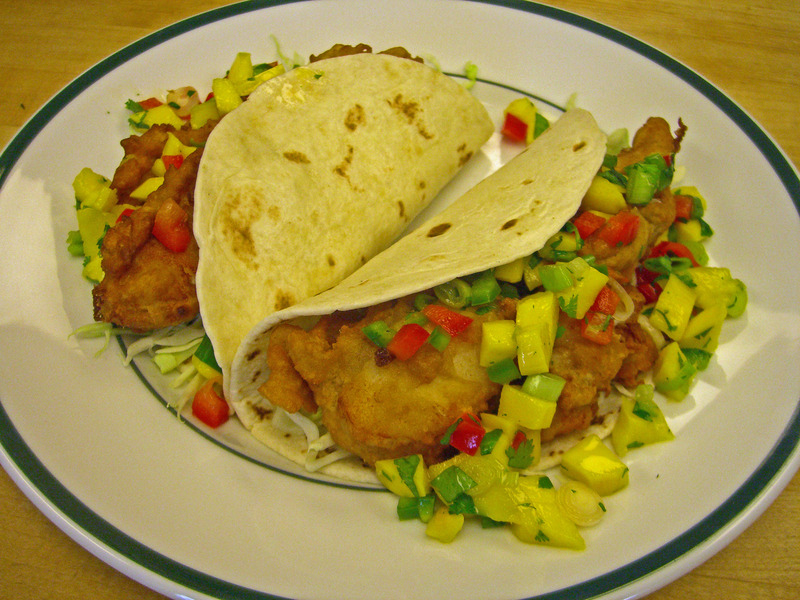 To augment the delicious flavor of the cod, we chose to bed it in shredded cabbage and cover it with Mango Salsa. Terrific flavor medley.